The National Weather Service issued a flood watch for Fayette County on Thursday, which continued into Friday morning, according to weather.com. As the county continues to thaw from the intense cold last week, cloudy skies and heavy rains oppressed the community, causing more flooding. This culminated in a flood watch being issued for portions of Kentucky, Indiana and Ohio as rain continued to fall Thursday evening. According to the flood watch, showers dropped an additional one half to one and a half inches of water on the area and stated that local totals are likely even higher. The NWS suggested that rain on top of the already heavily saturated ground may lead to more flooding that could linger into early Friday. They urged residents in these areas to be prepared to take action should flooding develop, and to monitor the latest forecasts and be alert for possible flood warnings. According to Nixle.com — an alert system the Fayette County Sheriff’s Office subscribes to that helps release important information to the community — Mark Road between U.S. 62 and Armbrust Road; West Fork Road between U.S. 22 and St. Rt. 729; and St. Rt 41 South at St. Rt. 753 are all closed due to high water. 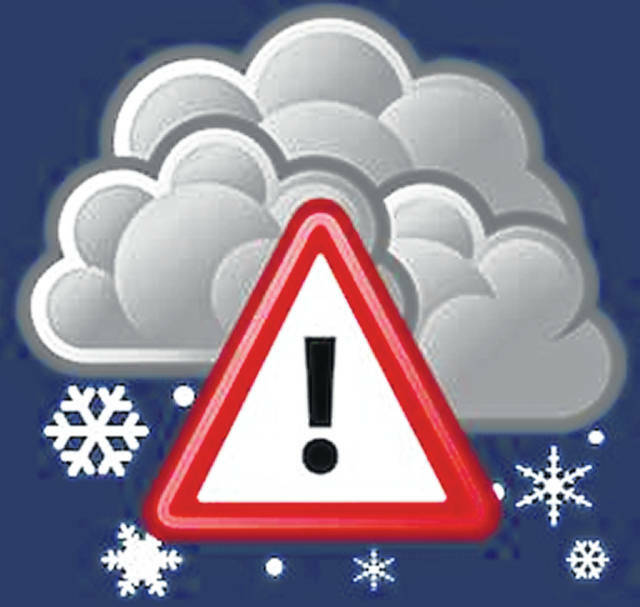 Stanforth urged the community to sign-up for free at Nixle.com to receive notifications on closings, emergencies and weather advisories. These notifications can be sent to emails and cell phones, and can even be sent to landlines. Though Friday and Saturday should be dry — according to the forecast — both days are showing high temperatures in the mid-to-high 20s and lows of 20 degrees or less. The county is more than likely not finished with precipitation though, as weather.com is predicting snow showers on Sunday with accumulations less than one inch overnight. Temperatures will range on Sunday from a 35 degree high to a 29 degree low. Starting in the afternoon, snow showers could develop with winds expected to blow upwards of 10 miles per hour. Chance of snow is 60 percent. Snow showers are forecasted to become more widely scattered later on overnight. Monday is also expected to have some snow, though it could give way to a mixture of rain and snow in the late afternoon. Temperatures are forecasted to remain in the low-to-mid 30s all day, and the chance for precipitation is 80 percent in the morning and 70 percent in the evening. Beginning Tuesday, Feb. 12, weather.com is predicting showers in the form of rain, snow or a mixture for eight out of the 10 days that follow. Stay with the Record-Herald for more on potential weather emergencies in Fayette County. Reach Martin Graham at (740) 313-0351 or on Twitter @MartiTheNewsGuy.